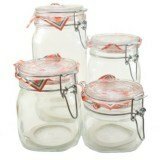 Also known as "Latch Lid Jars" "Canning Jars" "Clamp Lid Jars" "Fermentation Jars" "Air Tight Jars" and More! These jars are great for: Make Your Own Just-Add-Hot-Water Instant Noodles, Creme Brulee, Homemade Jams, Jellies, Marmalades and Preserves, Storing Nuts and Dried Fruits. 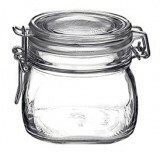 Also great jars for Pickling of Cucumbers, Okra, Peppers and more! Great Jars for Storing, Preserving and Displaying different types of Foods and Crafts such as: Rice, Pasta, Seeds, Spices, Herbs, Baby Food, Flour, Coffee, Sugar, Salt (including Salt Scrubs), Dog and Cat Food, Cereal and more! 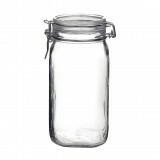 Our Jars are 100% Italian Hardened Glass made from the finest ingredients and strengthened to the highest standards. These are not cheap chinese glass jars (ex. 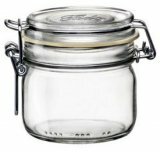 IKEA Korken jar with lid jars) and will not suffer the same thermalshock and breakage issues that comes with substandard glass.